Minneapolis-based brokerage Re/Max Results is rolling out a new consumer mobile app today that uses traffic data from INRIX Inc. to allow users to filter home searches by commute times for up to three locations. Consumers can enter a time they want to be at up to three locations and a maximum drive time for each, and then see all of the homes for sale that meet their required commute times. The app’s drive-time tool will also filter results using preferences like home price and number of bedrooms and bathrooms. Drive times from listings within the Twin Cities and western Wisconsin markets served by Re/Max Results are based on traffic, location and time of day. Built by Minneapolis-based app-maker Mobile Realty Apps for Apple’s iOS operating system, the Re/Max Results app is powered by INRIX’s “Drive Time” search tool, which is plugged into anonymous direction and speed data that’s updated every 15 seconds from 100 million vehicles, certain mobile apps and U.S. government-maintained magnets in highways. Property detail page in Re/Max Results’ new Apple app showing INRIX Drive Time stats. 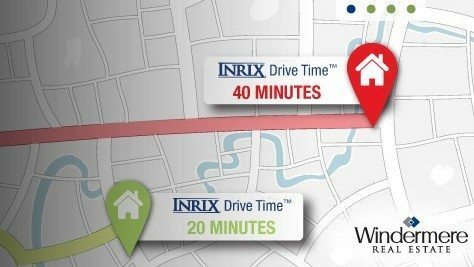 Windermere Real Estate rolled out a desktop version of INRIX’s “Drive Time” search in August. But this is the first time Drive Time will be integrated into a mobile app, Kevin Foreman, INRIX general manager of geoanalytics, told Inman News. Each property description surfaced with a Drive Time search features drive-time estimates to the specified locations. Time is the new way of measuring distance, Foreman said, not miles and kilometers. “Few people say, ‘I live 17 miles from work.’ They say, ‘I live 25 minutes from work,’ ” he said in a statement. 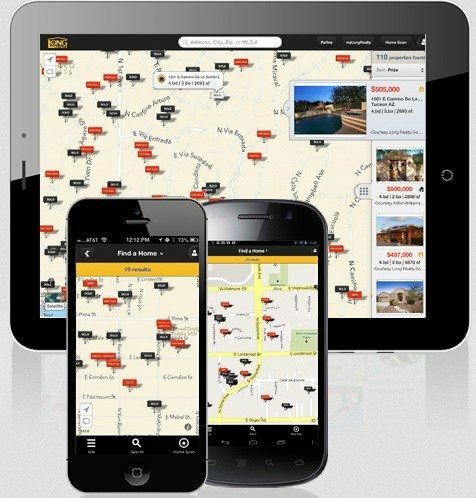 In June 2012, Re/Max Results integrated Mobile Realty Apps’ HomeSpotter augmented reality tool into its Apple and Android apps, which allowed users to see property details overlaid on their phones when pointed at a property, as well as the location of nearby homes for sale. Earlier this year, Tucson, Ariz.-based Long Realty rolled out Android and Apple consumer apps built by Mobile Realty Apps that surface for-sale homes from the shared pool of listings made available by participating brokers in a multiple listing service (MLS) — Internet Data Exchange (IDX) — with more in-depth MLS data like recently sold homes.